How Pure Emu Oil can benefit you… Provide relief from arthritis Provide relief from joint pain, muscular aches, bruising, sprains and strains Reduce irritation and inflammation caused by skin disorders, including eczema, dermatitis, psoriasis, nappy rash and cradle cap Reduce itching and pain associated with insect bites Reduce pain and scarring caused by burns High in vitamins A, E, and F A highly effective moisturiser A moisturising eye make-up remover Reduce redness and scarring caused by acne Regular application can aid in reducing stretch marks and age spots Emu Tracks Pure Emu Oil is 100% natural with no added preservatives. 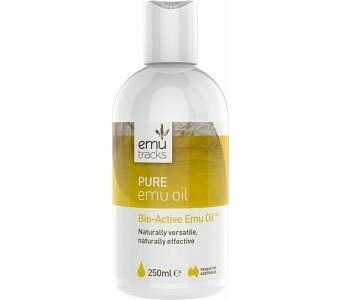 Pure Emu Oil is beneficial due to its powerful anti-inflammatory properties and superior penetrating properties that allow the oil to penetrate the stratum corneum barrier (outer layer of skin). It is a natural source of Omegas 3, 6, and 9 - essential fatty acids that are not produced by the human body but are essential for good health and well-being. Research studies have proven that Emu Oil can promote the regeneration of skin tissue, as it increases the rate of proliferation of fibroblasts, the main skin cells in tissue culture. A number of burns units throughout the world have shown that when applied topically, Emu Oil reduces pain associated with burns. It also speeds up the healing process and results in less scarring. Emu Oil is hypo-allergenic and is therefore suitable for people with sensitive skin or chronic skin conditions. When used correctly, Emu Oil products leave the skin smooth and silky without an oily residue. For best results, apply Emu Oil regularly.